On Friday, March 22, twenty-nine students from Ohio University's Hospitality & Tourism Program visited Hocking College's new distillery in New Straitsville. 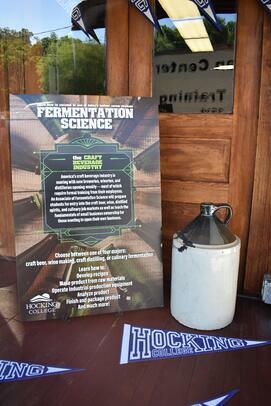 The purpose of their visit was to learn more about fermentation science. Activities the students participated in included learning more about the moonshine making process, as well as being able to see the newly renovated distillery and getting to taste the product. Fermentation science is a chemical process by which an outside agent is used to initiate the breakdown of an organic substance into simpler substances. However, most people would probably be more familiar with this term as it relates to the breakdown of sugar into alcohol in order to produce beer, wine and spirits. Also famous for being one of the oldest forms of food processing known to man, the historical roots of fermentation science can be traced back to 1000 B.C. when the Chinese used fermented soybean curd to treat skin infections. 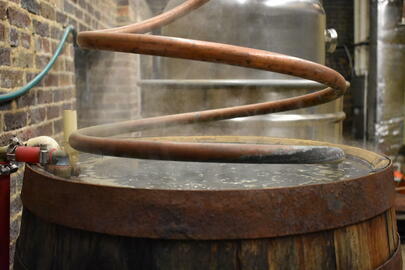 However, fermentation science has been primarily used throughout history to produce beer and wine. In fact, according to most historians, the production of mead and honey wine during the Vedic Period (1700-1100 B. C.) predates the creation of bread. Where can I study fermentation science? Hocking College in Nelsonville, Ohio added a fermentation science program to during their winter 2018-2019 term. Students who enroll in this program can choose to pursue either an associate’s degree or certificate in fermentation science. What skills will I learn in this program? For more information concerning Hocking College’s Fermentation Science program contact Program Manager Sean Terrell by email at terrells@hocking.edu or by phone at (740) 753-7149.